This is the Year of the Cucumber. And because of this bonanza, I needed to do something with all the extras. One family can only eat so much cucumber salad, after all. 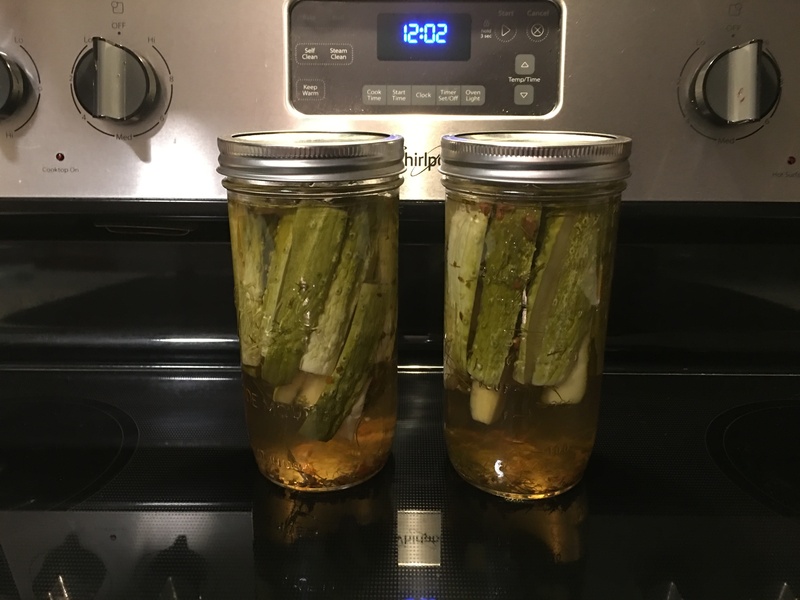 So I thought I’d try making pickles, as I so predicted I would. Know thyself, I guess. Anyway, off to the Internet! Unfortunately, unlike canning tomatoes, pickle-making has a far less unified following. The USDA, who’s sole mission it seems is to sterilize everything, was not helpful. 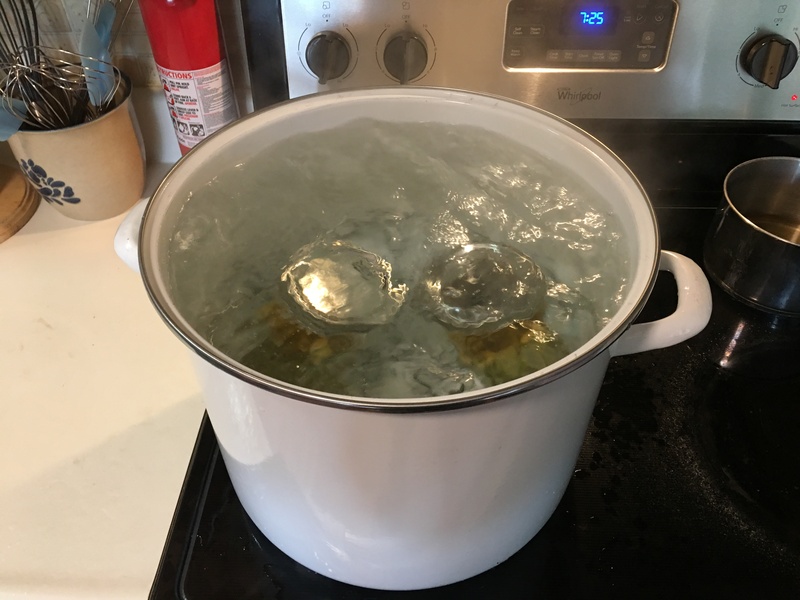 If you sterilize a vegetable, as in–boil it for 45 minutes–it becomes mush. This is fine for tomatoes, but when I tried a similar approach to pickling peppers a few years back, I ended up with a jar of pepper goo. I therefore sought anecdotal information. It boiled down (see what I did there?) to two main approaches: a high-temp and short duration treatment, or a lengthy but low-temp treatment. I opted for the first simply because it’d be a quicker process. The brine consisted of equal parts cider vinegar and water, with salt, then boiled. I cut cucumbers into spears, packed two jars, then poured in the boiling brine, then flash-boiled the jars. I added additional seasoning of dill seed, dill fronds, and crushed red pepper. Admittedly, I have no idea what I’m doing here, but presumably the brine preserves the cucumbers, which supersedes the need for an extended sterilization process. I suppose I’ll find out. To reiterate, mushrooms are creepy. And yes, that’s based on traumatic childhood events. At the time, she recoiled a little at the sight, and exclaimed that there was a bee nest in the mint. It did indeed look like a nest of some kind–sort of papery, like a wasp’s. I certainly don’t mind the majority of arthropods, but I don’t relish coming into contact with them either. If it was indeed a nest, and those were larvae within, then…gross. But I’ve never encountered any sort of nest like that, nor did it seem like a good nesting spot, so I had my doubts. Anything this weird, if not an insectoid machination, must be fungi. I snapped this picture and decided I would look into it later. Later came after attending a résumé-building session. I was asked to coach. Interesting, that sometimes people want to know what I have to say. I’m more accustomed to shouting into the void. But anyway, I needed a respite, so I pulled up my photos and saw this. The search began. I did not find any insect nests that resembled this, so I pursued my second theory. It wasn’t long before I discovered Bird’s Nest Fungi. It was one of the easier fungus identifications, due to it’s unique appearance. There’s a variety of species of course, but the family is Nidulariaceae. It’s possibly Crucibulum laeve. 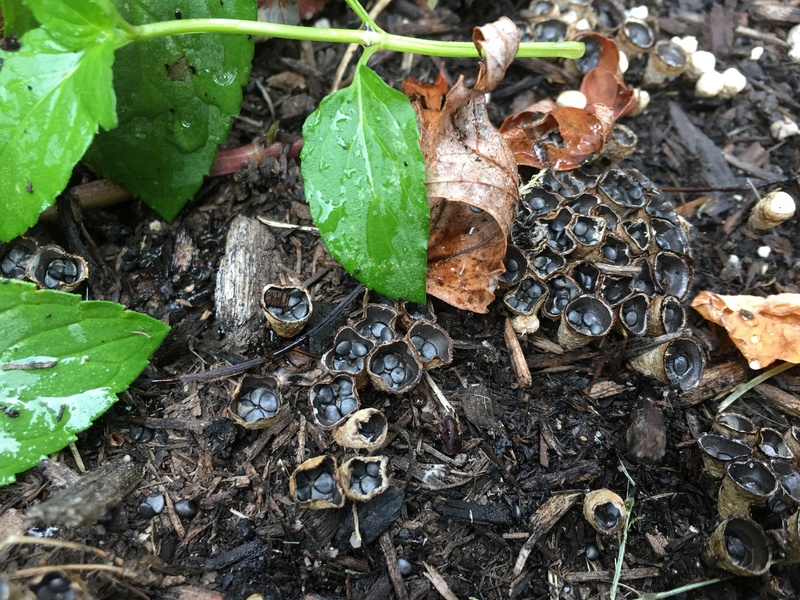 Wikipedia says they are not edible, they grow in mulch (appropriate since they were growing in potting soil), and release spores when struck by raindrops. One more fungus species added to the catalog. 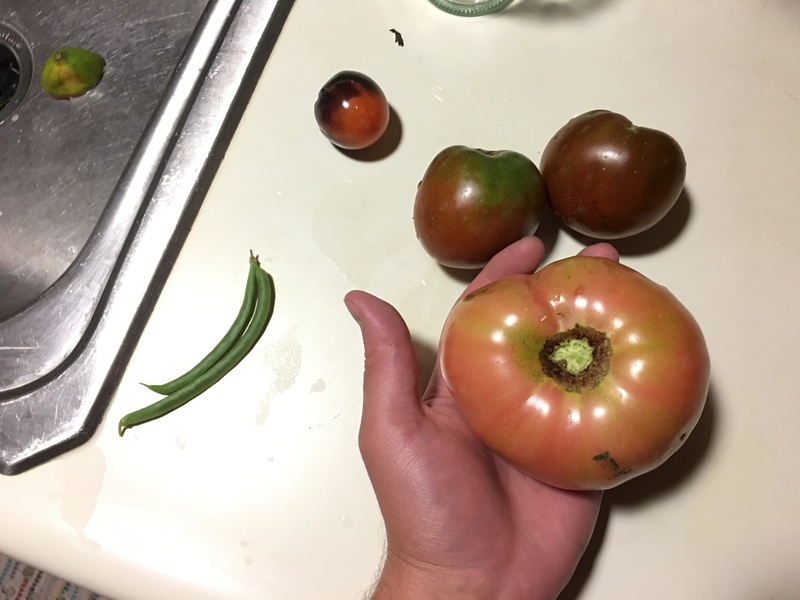 My first tomato this year was premature–the unnatural result of artificial greenhouse growth and fertilizer saturation. 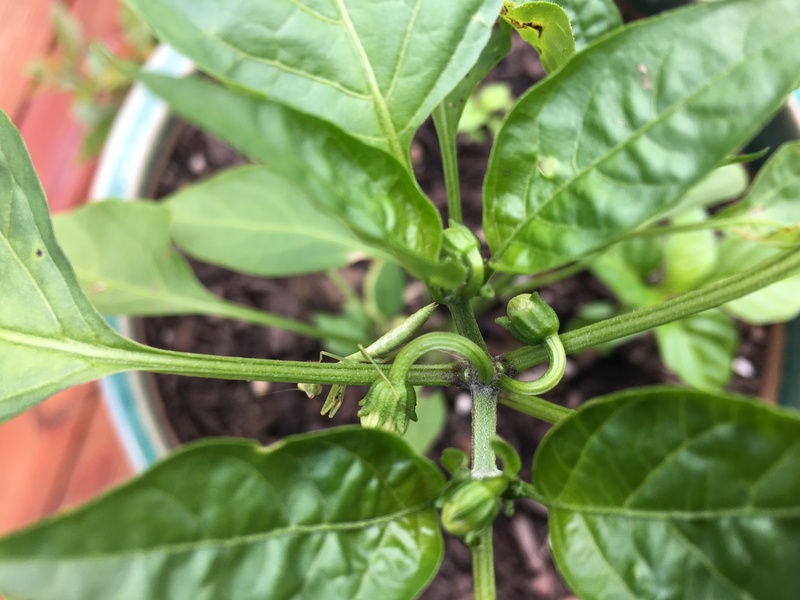 And while my current yield is still of these purchased plants, I can at least attribute this batch to my own TLC. That small one is an Indigo Rose, the two in the middle are Black Prince, and the one in my hand is a Pink Girl. I wonder who names these? The trouble with heirlooms is that until I harvest one, I never know when a particular variety is ripe. They’re nice and squishy though. So it begins. Revitalized and slightly inebriated, I exit the inn. Then I realize it’s nighttime, so I stand in the cobblestone street for 9 straight hours, unwavering. I realize this seems like an odd choice, seeing as I just left an inn, but I don’t want bedbugs. Actually I just don’t want to level, and sleeping would force me to gain intelligence, willpower, and whatever other 3rd skill I would choose. But I don’t want to, because then every single living creature in Cyrodiil would also gain a level, thus perpetuating the endless arms-race. So nay, I shall maintain the status quo, staunchly refusing to gain knowledge and wisdom out of fear of change…just like a Republican, BAM! Trance-like state of suspended animation complete, I greet the new day. The Jemane brothers also stand, having joined me in an exercise of suspension-trauma. I shake the blood clots from my legs and resume jogging. My first order of business is to examine the local Skingrad chapel. I circle, but no trees ever quite line up with its facade. Bummer. That would have been an easy resolution. I consult the painting again. The green blobs, or Bob Rosses, if you will, might indicate their species. I decide that they’re oak, and impressively the game does do a good job of emulating real biodiversity. 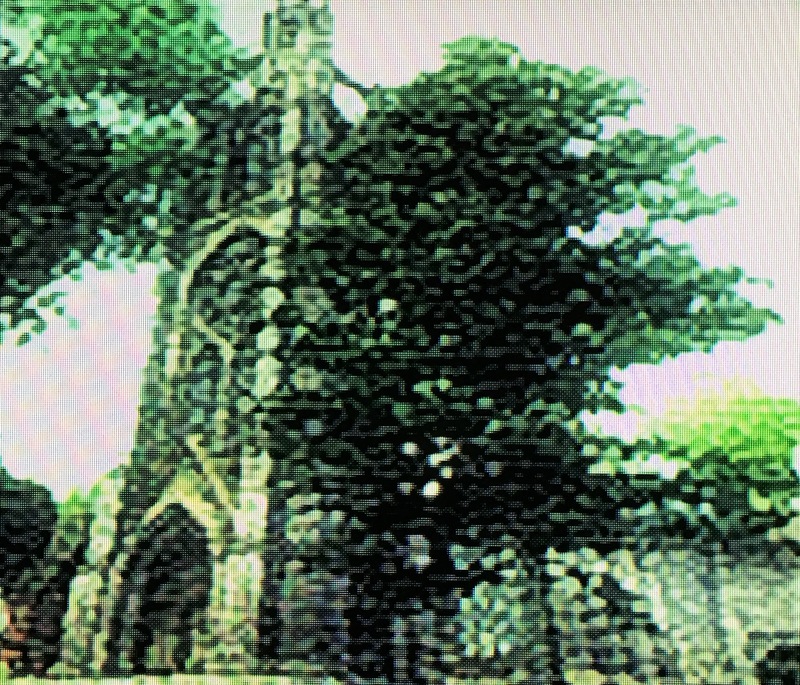 And I know from playing the game that oak trees primarily inhabit the Great Forest, which means Chorrol. I will therefore resume my travels, likely having to slaughter countless bandits and endangered timber wolves along the way. I leave the town, head north around the city to travel east, and slaughter an endangered timber wolf. Maybe not sit on the road? Or not attack me on sight? And don’t wolves usually travel in packs? Lone wolfs are generally young males in search of a pack. So Cyrodiil is a giant bachelor’s club for timber wolves. As I ponder how many wolves I’ve killed, I fear for their next generation. My fears are assuaged when I happen upon another timber wolf, and have to kill it. Then I’m accosted by two imps and a troll. Tired of the pointless slaughter, I turn invisible. The immediately disoriented fauna give up, then attack the Jemane brothers who, being slower than I, are just now catching up. Curious, that they know my exact whereabouts, despite me leaving them behind and turning invisible. Absolute power corrupts absolutely, and I walk away from the ensuing violence to continue my trek, indifferent to the life and death struggle behind me. My invisibility spell wears off as I emerge from the forest to the view of Lake Rumare. A decade ago, the graphics were phenomenal. They still are, in a retro way. But like any game discovered long after its prime, the Internet is filled with Millennials who are certainly less appreciative of this game than I. But I will not let this game go quietly into the night. It’s going to survive! Fortunately, my waning repertoire of bad jokes meets its end when Oblivion crashes to the dashboard. Perhaps this quest is folly after all. 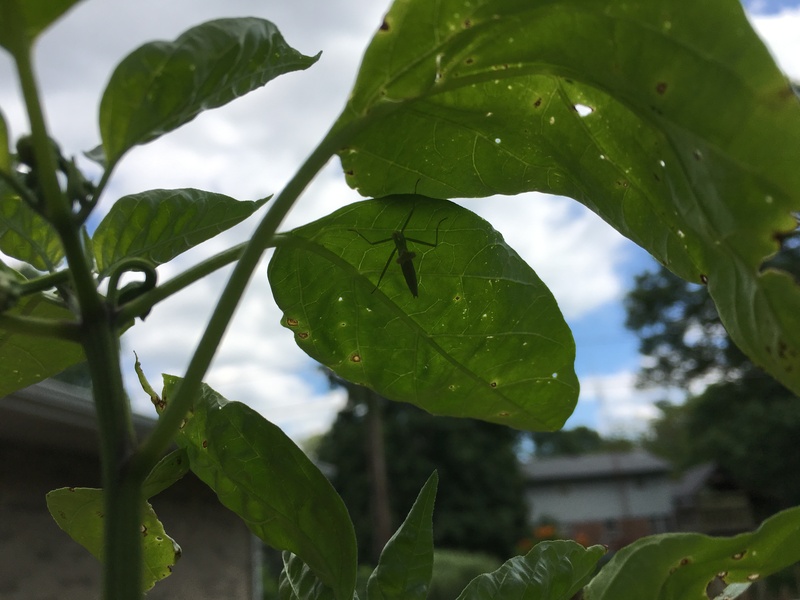 Mantises arguably qualify as cool members of the insect class. They’re also really creepy. But, like spiders, they adhere to what I like to call the “Quarter Rule”. That is to say, if they’re smaller than a quarter, then they’re cool/cute. If they’re bigger, then I’m grabbing my 20ga. They’re primarily ambush predators, and I recall from my childhood that once they claimed a spot, they tended to not leave unless hungry. It’s been a week and he’s still there. 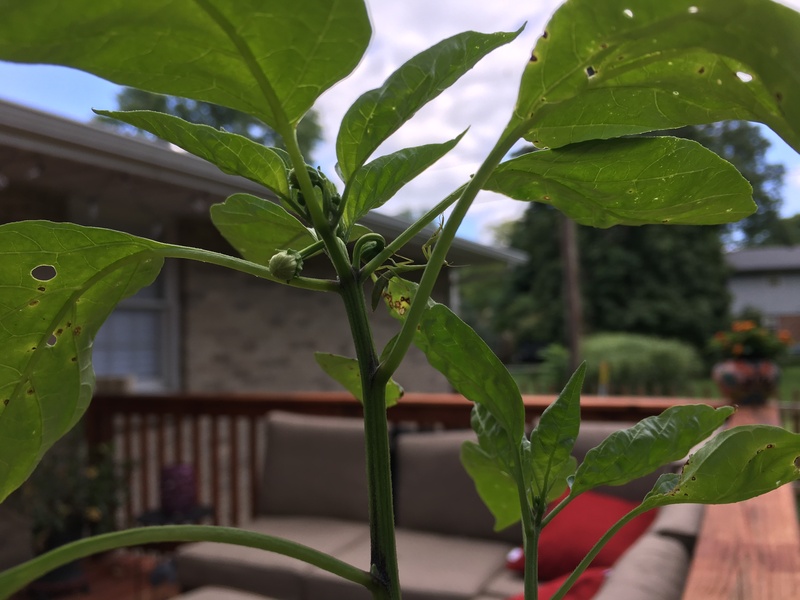 So it would seem that my jalapeño is lucky enough to have its own guardian.